Smart branding is placing the focus on what makes your organization unique and fantastic, and builds recognition from that foundation. Strategic marketing is planning where to place and how to deliver your message in a way that builds value for your brand. 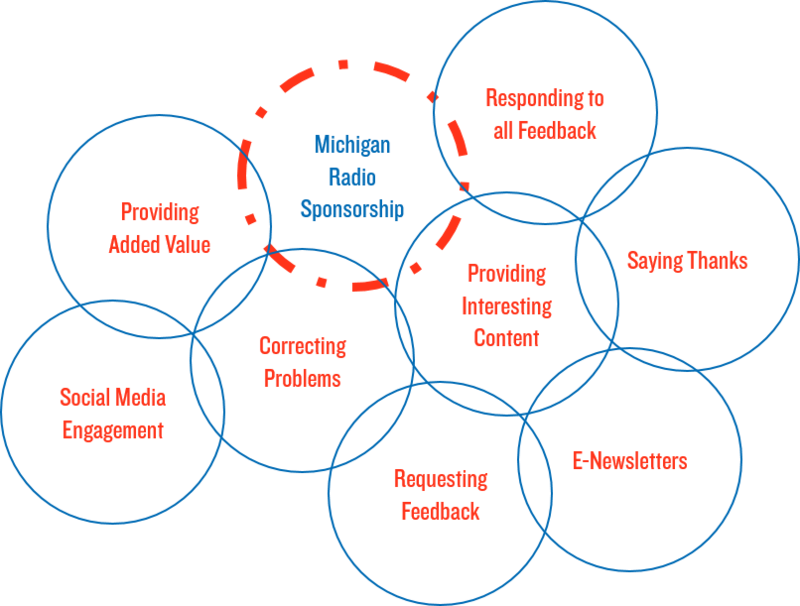 Sponsorship on Michigan Radio achieves both, adding value to your brand by associating it with high-quality, trusted content. A well-crafted sponsorship schedule delivers a consistent and meaningful message to our audience that conveys your support of a resource they value. Customized messages promote events or specific aspects of your product and service that underscore the essential value of your brand. Show our engaged audience that you are committed to your brand message and to Michigan Radio with a schedule on-air and online – contact us to learn more! Check out the other posts in our Branding with Michigan Radio series! In part one of the ‘Branding with Michigan Radio’ series, we defined branding. You can read that here. 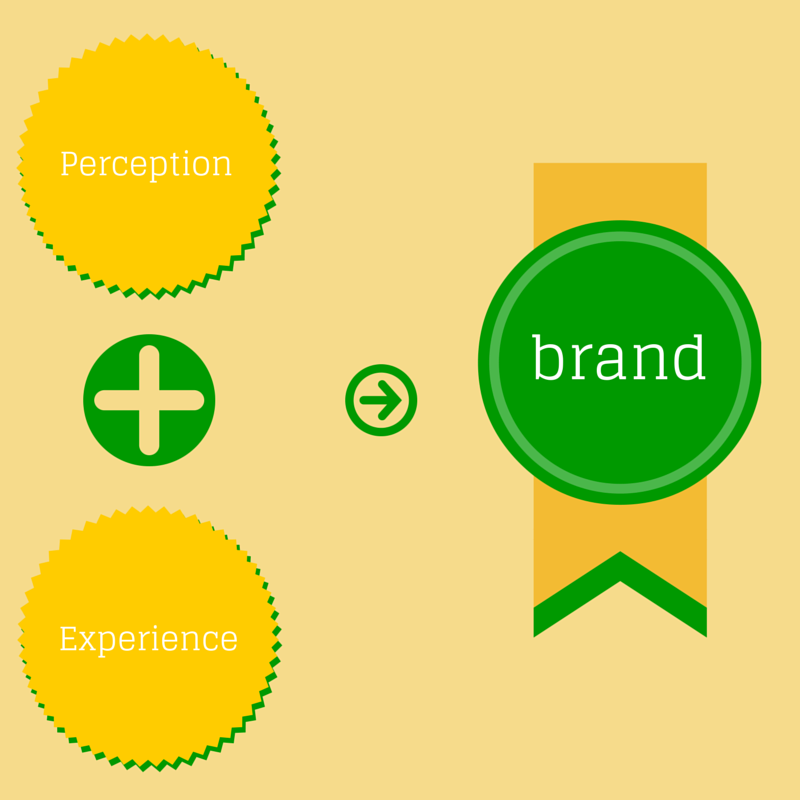 In part two, we talked about the perception of your brand, which you can read here. In this part of the Branding with Michigan Radio series, we’re going to talk about how your customer’s experience impacts your brand. Solidify your customer’s positive perception by giving them an EXPERIENCE to remember. In part two, Bill heard how great you are, he’s in the store and you need to back that up by actually being great. If that smart manager he heard about lets Bill down, any positive perception that he may have had is out the window. If you give Bill a good experience, you have reinforced the perceptions that you have built with your branding strategy and your marketing tactics. We’re sure that your organization has the ability to deliver a positive experience – but how are you getting the word out about that experience? Contact us to increase the positive perception of YOUR organization today! See all the posts in the ‘Branding with Michigan Radio’ category here. 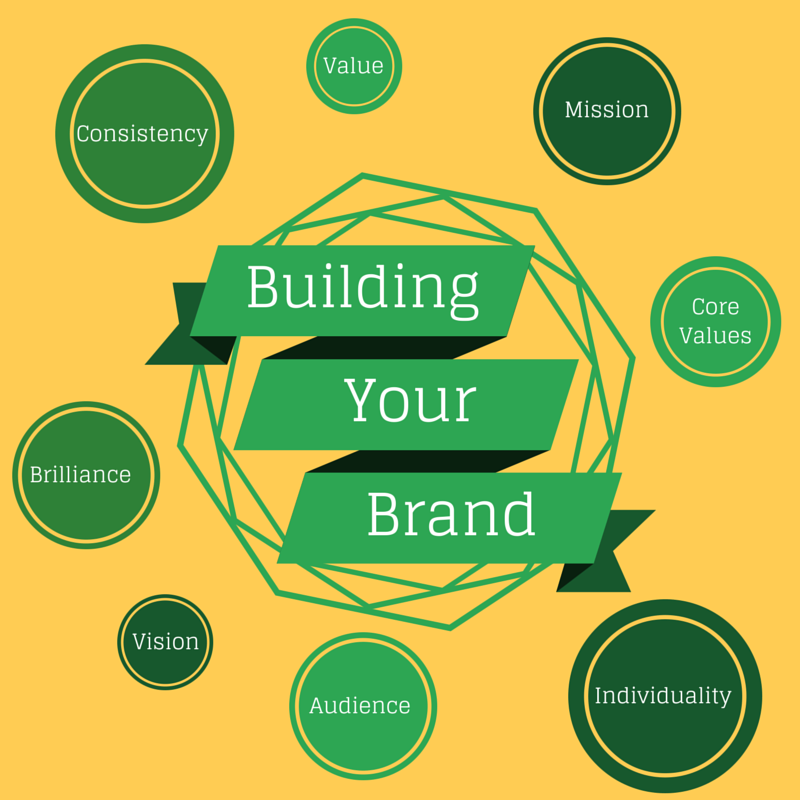 We defined branding in part one of the ‘Branding with Michigan Radio’ series. You can read that here. In this second post, we’ll discuss the best way to get started with your branding plan. The first thing to consider when building your brand is PERCEPTION. What many businesses don’t consider is this very critical fact: Perception = Reality. How your customer (or potential customer) sees you is FACT for them, whether or not you would agree with it. Let’s take an example here: Bill hears from his friend that the manager of your retail location is knowledgeable about the product you sell. Bill now PERCEIVES that if he needs to learn something about that product, your store would be a great place to do it. So how do you manage that perception? How can you make sure that your customer base thinks “knowledge” when they see your logo? The most obvious answer is that you tell them, with your marketing efforts, that you are knowledgeable about your product. But you must consider that your customers may not trust every word that you tell them. So you need to look for subtle ways to convince them. One way is by showing them – make yourself a presence in social media or with a blog and offer FREE KNOWLEDGE about your product. This will help you prove your point long before your customer makes it to your door. Another way to manage those perceptions is who you market with. Choosing a high-quality, intelligent media outlet results in the perception of your brand as also being high-quality and intelligent. Michigan Radio listeners find our sponsors more credible than their competition, providing a powerful branding vehicle in just 15 seconds. 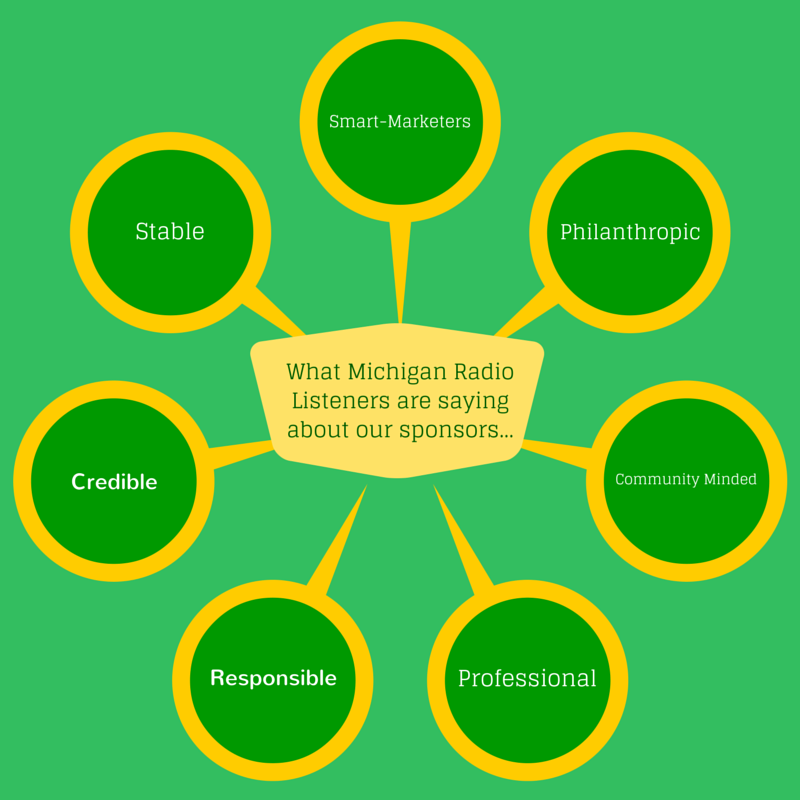 Your brand is elevated simply by being associated with Michigan Radio. The company you keep matters. See all the posts in the ‘Branding with Michigan Radio’ category here or go to the next post here. Branding with Michigan Radio: What IS Branding? You’ve heard about branding and how important it is for the success of your business. You have put time and energy toward making your logo recognizable and becoming a ‘household name’ in your industry. You’ve had meetings, both internal and external, about the best way to differentiate your business from the steady stream of competitors out there. Are you still feeling like you don’t really have your arms around this “whole branding thing”? Great news! Michigan Radio can help with that! Most people think “name brands” when they think of branding: “Kleenex”, “Coca Cola”, “Microsoft”, “Ford”. They are right. Kind of. So what is branding, precisely? Isn’t it the same thing as marketing? 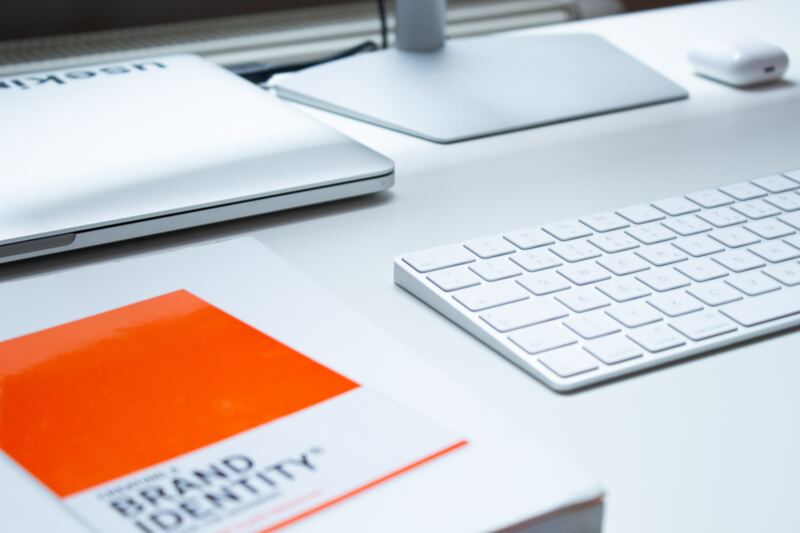 Branding is strategically building your name, planning to make yourself recognizable and managing what your customer base thinks of when they see your logo or hear your business name. Marketing is carrying out your branding plan: creating your logo, placing your ads, writing your copy. Marketing is the tactical part of your branding plan. Now that you know what branding is, learn more about managing what your customer base thinks of when they think of in the next post of the series.